Ever since Volkswagen unveiled its latest small car Volkswagen Up at the 2011 Frankfurt Motor Show, we have had our eyes on the latest happenings regarding the car. Recently the Up won the European Car Of The Year award and I am sure each and every person involved in the making of the car, starting from the initial sketch to the actual production model, must be happy about it. Up is seen as a complete package for urban commuters but one of the most important features it lacked was an automatic gearbox. Having an automatic transmission car in cities where traffic is a problem, is like a boon but unfortunately the same was unavailable in Up. But taking it seriously, Volkswagen has unveiled a semi-automatic variant of the Up in UK, lately. Unlike other cars belonging to the Volkswagen Group that feature Volkswagen’s dual clutch DSG , the Up has been fitted with an ASG unit. The ASG unit is nothing but an automated version of the 5 speed manual gearbox in which the system can work in two ways: either the gearbox can operate without the assistance of the driver(the conventional way) or the driver can shift gears on his own. What is disappointing is the fact that paddle shifters are missing from behind the steering wheel and the driver will have to use the gearstick to shift gears. 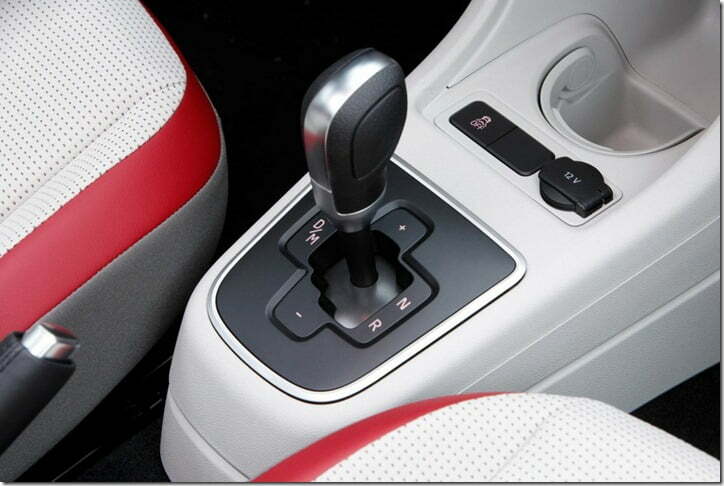 The gearbox features three modes: D to drive, R to reverse and Neutral. There is no ‘P’ Parking mode. Although the gearbox has increased the overall weight of the Up by 3 Kgs, surprisingly the car offers better fuel efficiency than its manual counterpart. Yes its true, Volkswagen claims the Up ASG returns a mileage of 27.29 KMPL which is 0.59 KMPL more than what the manual version offers. Not only in fuel efficiency, the Up automatic comes with improved emissions too: emits 3 g/km less than the manual version. As far as the pricing is concerned, Volkswagen is offering the automatic Up at an additional GBP 595 which converts to Rs. 51,000 in Indian currency. We all know that Volkswagen has started testing the Up in India and over the past couple of months such test routines have become more frequent. Now whether the company will introduce the ASG to the Indian market too, is yet to be seen. Stay tuned to Car Blog India for more updates on the small wonder Volkswagen UP.